TXT Manager is an SMS customization application. You can configure people to have customized sounds play when they message you, as well as customized vibration. This is helpful when you are expecting or need to respond to important messages quickly (like being on-call for work). I am working to resolve the last item. Donate: If you find this app useful, donations would be greatly appreciated. - Users will have to be reconfigured if upgrading from 0.8.5. Sorry for the inconvenience again. 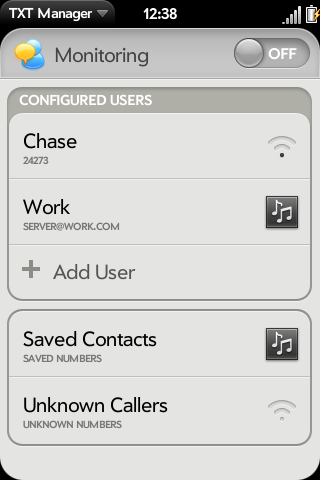 - User list will need to be reconfigured (delete all and add them back) if upgrading from 0.8.0. Sorry for the inconvenience.